The market had a huge up day yesterday; the Dow Jones was up +300 points, and the SP500 was up 1.37%. These are both big days after a decent move higher. 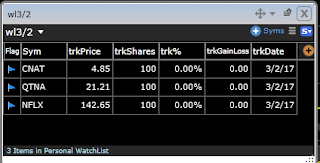 There’s not much to do here as far as swing trading; you take some off and ride the rest. I would not be aggressive putting on new positions until the market corrects either through time or price. Our stock of the week $CALA had a huge day yesterday up 28%. The report was released yesterday at 4:00 in the morning, you can sign up for our stock of the week report HERE. 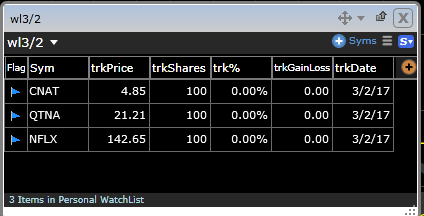 We only have three stocks on our watchlist today; $CNAT $QTNA $NFLX. We have an interest in these stocks if and only if they can get through yesterday’s high plus .10-cents, that is typically where our buy stops will be. This single criterion will narrow down the list to a handful of names unless of course, the market is super strong. You can also narrow down the list by float, price, sector, preference, etc. My name is Jon-Paul Casias, and I was wondering what your reasoning is when it comes to your strategy. Almost everyday I see you post on twitter saying that "stock xyz is on our watch list but only if it goes through yesterdays high". And I was just wondering why you pick that strategy and what makes it valid.